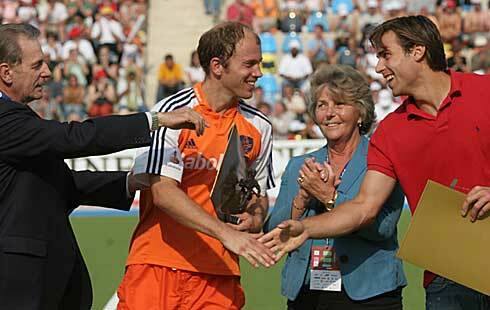 The awards were presented by IOC Präsident Jacques Rogge (left) and FIH President Els van Breda Vriesman. 2006-09-12  The International Hockey Federation (FIH) has announced the nominations for the 2006 WorldHockey Men's Player of the Year awards. The awards will be presented by IOC President Jacques Rogge and FIH President Els van Breda Vriesman during half time of the 7th place playoff (approx 15:40) this Saturday, 16 September.